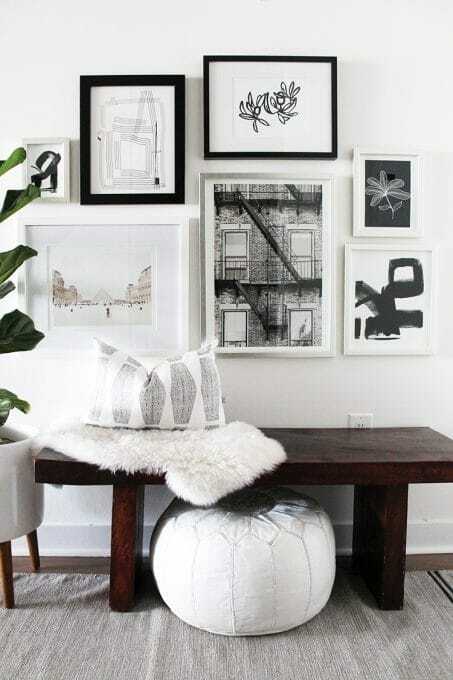 The modern entryway decor ideas in these 11 entry’s are perfect for a small front entrance. These ideas would be great to steal and put in your own home. How do you greet your guests in your home? What is the first thing they see? Our entry was not giving the right impression to our guests and I was on a mission to change it. 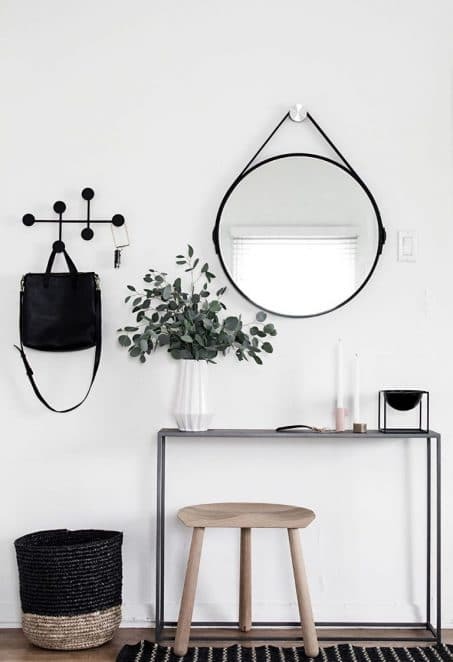 As I searched on Pinterest, I started to realize there were certain features I was drawn to in modern entryway decor and pieces I knew I wanted to incorporate into our new and improved industrial modern entry. Here are some of my favorite entryways that I kept being drawn to. See how our entry turned out here! Click on the numbered link to see all the details about each individual entry. 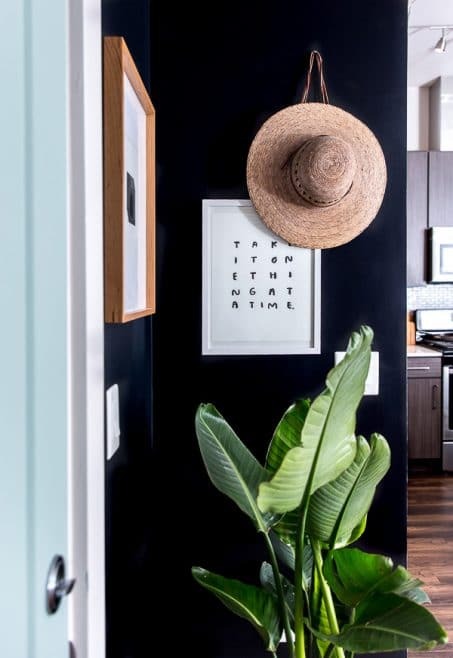 This striped entry from Holly & Ryan’s home shared on Apartment Therapy is gorgeous! 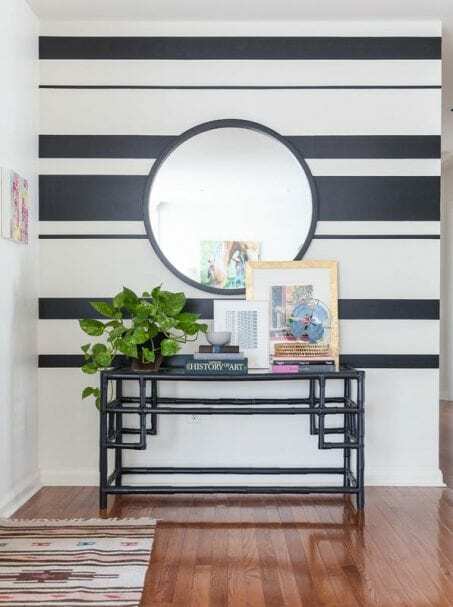 I love those bold stripes on the wall and mirror! You all know I’m a huge fan of the One Room Challenge. This entry makeover The Vault Files did is incredible! Related: See our dark and moody powder room we made over for the One Room Challenge. I love this dark and dramatic entry from Brittni at Paper & Stitch! Simple, yet makes an impact. Of course, I love that bench since it’s practically identical to the one we made, but that planked wall with black knobs is also gorgeous! Of course I need to include our own entry now. I love how the dark shims on our wall adds so much texture to our entry. See all the entry details here. This bold and moody entry is gorgeous from Home Polish! I love absolutely everything Amy shares on her site Homey Oh My. Her entry is no exception. I love the simplistic, minimal feel, but it still shows her personality. So stunning! This entry from Chris Loves Julia has transformed over the years and I love everything they’ve done with it. See what it’s been updated to now below. Here is what Chris Loves Julia’s entry looks like now. The bench is a must-have in a home with little ones around for putting on and off shoes, but I also love how they have a dresser now to ground the place. 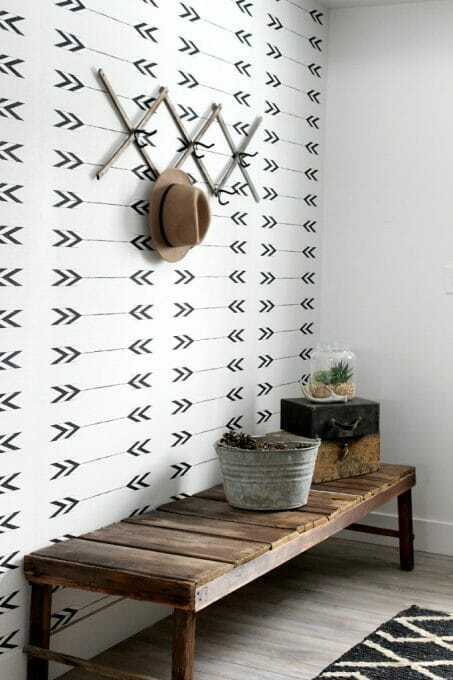 A little too rustic for my taste, but I love the pattern on that wall! 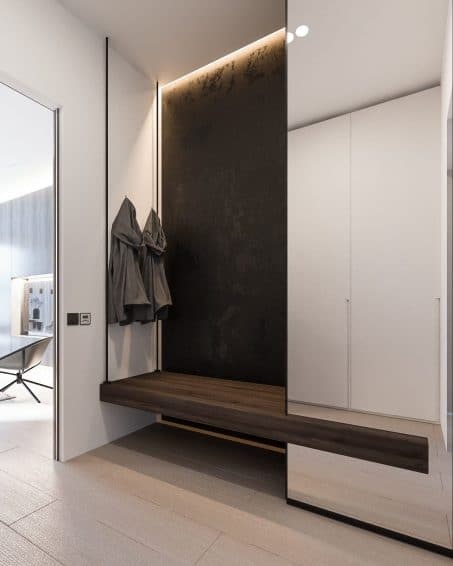 This minimal entry is effective and stylish. I love the dark wall and gorgeous bench seat! 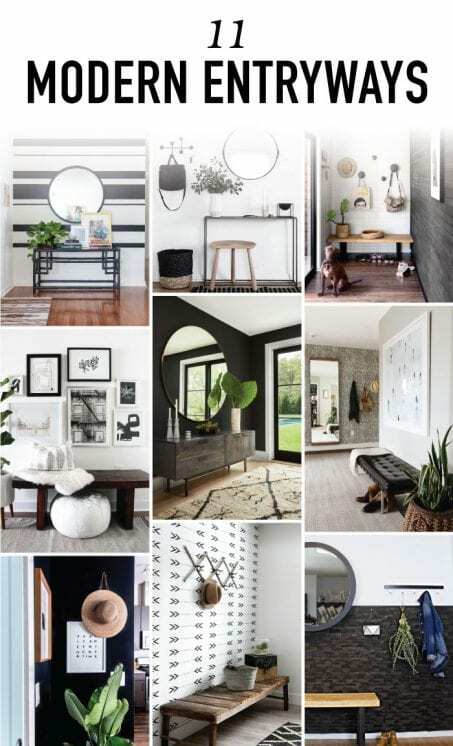 Looking at these entry’s, I was able to see we should definitely include a large, round mirror, a bench, mainly neutral colors, and somewhere to hang coats. Other than that I wanted to keep it pretty simple. I love all these entry’s and I love how ours turned out.